Confession: Once upon a time I threw away my mom’s ceramic statue into a burning pile of trash in our backyard. I remember being very young when I asked mom what the little ceramic statue was. She said it was something that her friend had painted for her. It was painted very well in 2 different shades of green. She called it a “Buddha” statue and told me that some people rub him on the belly for good luck. It was actually one of those smiling round bellied kitchen god statues. 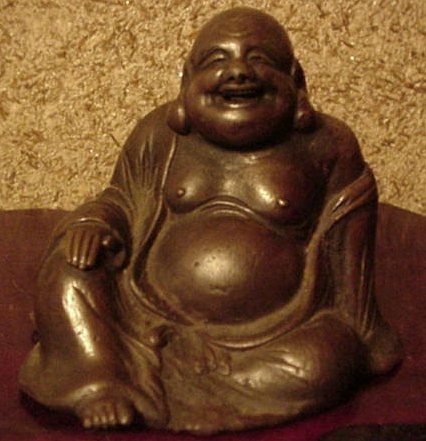 I remember passing by the little fat statue on my mother’s dresser and occasionally I would stop and rub my index finger all over the shiny green belly. I was young enough to still have to look up in order to see on top of the dresser. I was not raised in church but my mother did speak to me about God and answer questions that I had. I can’t say that I had a very firm foundation in Christian principles from a young age, but I do know that I always had a wide open heart. In 3rd grade we were doing some free writing time and I started to write my own origin story. (You know, because every normal 8 year old feels compelled to explain what’s going on in the universe.) This little piece of paper with one single sentence still exists in my mother’s archives of my humble achievements. My origin of the universe story starts and ends like this, “Once upon a time, God and Mother Nature decided to have a baby, they named him Jesus.” I remember the look on my teacher’s face as she picked up my paper and read the sentence. I was pretty proud…she looked a little concerned, if not horrified. I’m glad that I never finished more than a sentence of that story–I probably would have developed my own little following, I was a very charming child. That same year my mother supplied me with a little red Gideon’s Bible. I took a little highlighter to it and marked up a few passages. My mother also taught me to say the Lord’s Prayer at bedtime. She would follow up with the “as I lay me down to sleep” prayer (which is kind of creepy to me now). My mom guided me spiritually the best way she knew how, through ritual prayer. Where my mother may have been uncomfortable to go, members of my small town community stepped up. Like many children my introduction to church was Vacation Bible School. Not long after my first experiences in church, two Kingdom missionaries, Dean and Lola, began picking me up for Sunday school every week. They drove 5 miles from town–to pick me up in the country–and 5 miles back to town–to church every week. They would usually take me home too. That’s 20 miles out of their way every week that they would drive so a young child could be a part of a local congregation of believers. I really appreciate what Dean and Lola did for me. In fact the only childhood Sunday school lesson that I specifically remember was taught by them on Father’s Day, we made key holders with a sea shell on them. The actual lesson was about not being unequally yoked. Confession: It is not easy to admit that as the most vivid Sunday school lesson for me. When I was a teenager I had a rather unhealthy obsession with the Beatles. I was a part of the odd 2nd wave of Beatlemania that erupted after the Beatles Anthology was aired on television. My locker was full of pictures from the White Album and photocopies of the Beatles in Hamburg. I won’t even get into the embarrassing mop top I sported that I fear will surface some future #throwbackthursday. I would not have labeled my obsession as idolatry then. I read numerous books and biographies daily about them, I listened to their albums in my sleep, my friends and I wrote notes to each other as them, we lit John Lennon decorated candles on December 8th, we celebrated their birthdays, I defended John Lennon’s statements about being bigger than Jesus. (Honestly sometimes I still do—he said he didn’t mean, better or greater.) I do not feel that my obsession with the Beatles made me happier. Despite outward appearances, I felt very lonely though I had many friends. Devoting yourself to a band that broke up over a decade before you were born and taking for granted your relationship with a true and living God is never the key to joy. I imagine that a few of my friends from that era would be surprised that I feel that I was neglecting God. I was very active in my church and felt very compelled to share the gospel. I felt bold, yet challenging, calls to ministry as a female who was Southern Baptist at the time. During one particularly zealous day I picked up my mother’s kitchen god statue and carried it out back to a pile of burning trash. I took out my own frustrations with idolatry on someone else’s statue. (Ignore plank, look at speck.) I hungered for deeper knowledge but I wasted so much of my gifts on empty pursuits. Although, I knew better, I actively neglected the Divine and venerated the dead. As awful as that sounds to me and as painful as it is to write, that doesn’t even come close to my most egregious acts of idolatry—it’s just the easiest to put into words. After I graduated high school and began college I was able to draw closer to Jesus. I recognized how my behaviors had distanced me from joy. I spent the first half of my college career heavily involved in the youth program at my church. I taught a missions program for Kindergarten-6th grade girls. I transported kids to services, just as I had been transported years ago. I served as a missionary for 2 summers. I lived a lifestyle of prayer. I was described as altruistic by my professors and I boldly let them know that the altruism didn’t originate with me. I was humbled over and over again by the generosity of God’s people. I was full. When I was informed via email that I was not going to be sent as a missionary for a 3rd summer I was quite devastated. I was informed by my former association that through prayer it had been discerned that God had something different in store for me. They stated that they were heartsick over the answer, but that didn’t make it hurt me any less. Looking back I should have sought my own answers through prayer, but that moment of rejection was the moment when I began to open myself back up to what the world had to offer. Oh how quickly I filled up my life with “something different”. For the decade that followed I inadvertently placed people and things on pedestals as idols in my heart. If I had been called out as these grievances occurred I may not have been able to acknowledge it. You can’t change the past, but you can own it and learn from it. During the past decade–I have idolized a spouse, my career, and even my children. I believe that these acts of idolatry have been more destructive than all previous instances. I believe the sins that harm the most are the ones that affect other people. I have lifted up others so high that I have unwittingly encouraged them to stumble. I dragged myself through the world’s depths and forgot to shine His light. I dreamed of beautiful beaches and built houses on the sand. There’s been a change in me. I began to study the Bible weekly with a friend over 2 years ago. Sometimes you don’t realize just how hungry you are until you begin eating. I was starving. In the last 6 months my lifestyle of prayer has returned. I’ve let go of a lot and gained more than I lost. I’ve drawn the line and stumbled across. I’ve raised the bar and grasped thin air—but I have joy. I have felt my heart well up with the Spirit so fully that it seemed my heart would leave my chest. I’ve heard that still small voice in times that have amazed me—and the message is good. I still enjoy the Beatles. My children’s favorite lullabies are Golden Slumbers, Blackbird, and Come Together. Being fully aware of how I have made idols before—I am being careful of my thoughts and actions. This cautiousness could easily translate in seeming aloof and distant from people that I think are awesome. You know what they say, better safe than idolatry. To the bottom and very moved by your thoughts… blessings. I admire your dive into searching out your past experiences and your courage to share. You’re a great inspiration. Thank you very much Stephanie. You are so kind. I work with Jeanna and she truly shows her passion for God everyday in helping people. This was an awesome blog! Thank you for sharing. Oh my soul, that sure warms the heart Brenda.